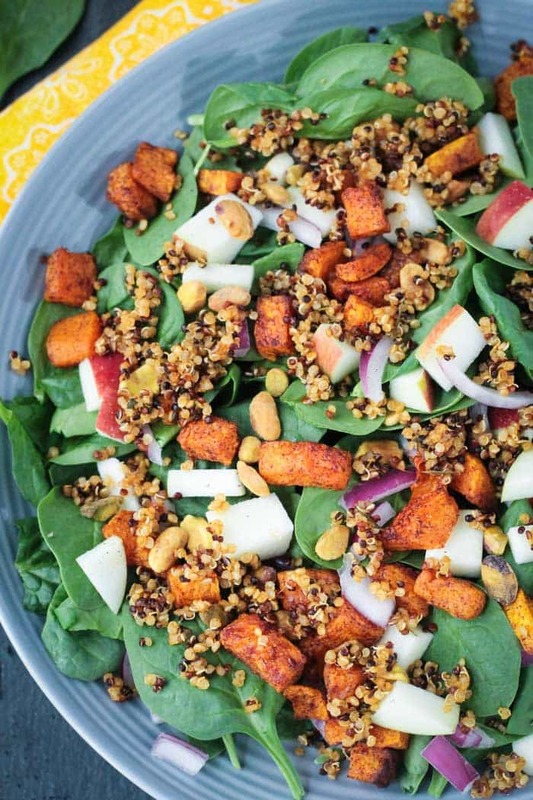 Quinoa Spinach Salad w/ Butternut Squash & Apple – a delicious and flavorful fall salad. Easy enough for a weeknight dinner, yet fancy enough for entertaining. I say this all the time, but salads don’t have to be boring. It’s not just lettuce and tomatoes. A salad recipe can be anything you want it to be. It can be light and easy or hearty and comforting. I was inspired by fall produce when I created this nourishing bowl. 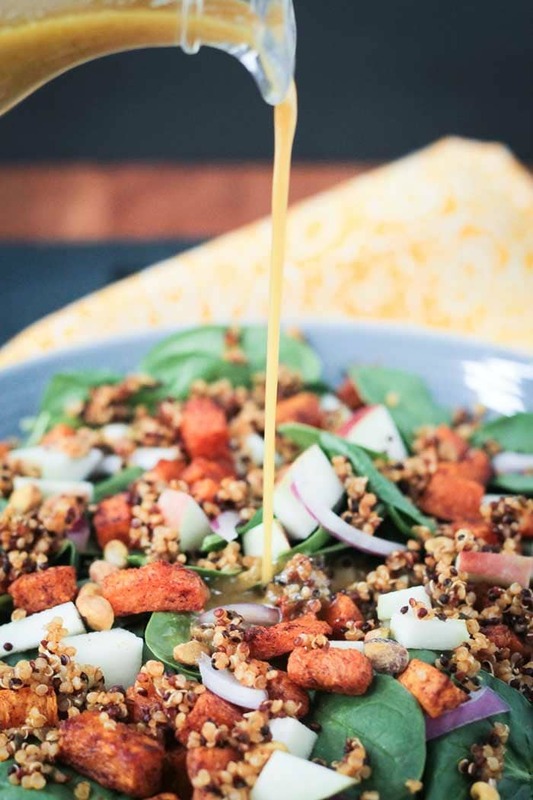 This Quinoa Spinach Salad with Butternut Squash & Apple is flavorful and full of vitamins, protein and fiber to keep you satisfied. Plus, it’s pretty to look at, don’t you think? Butternut Squash is one of my favorite vegetables. It’s sweet and creamy and delicious. Not to mention, it’s so incredibly versatile. It’s the magic behind my irresistible creamy dairy free mac and cheese, it’s the sweet element in my Slow Cooker Black Bean Chili, and it’s the dreamy autumn flavor in my Cinnamon Squash Quick Bread. 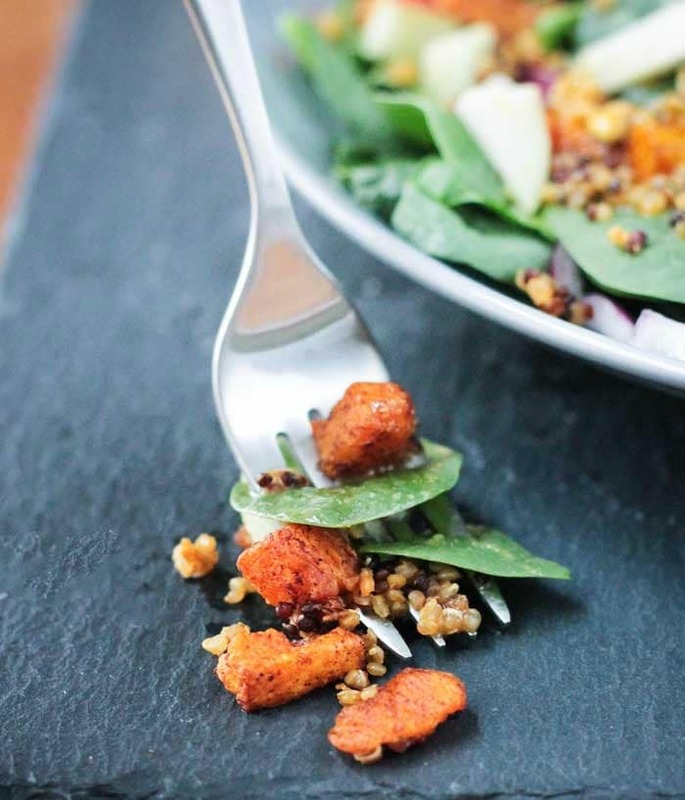 In this Quinoa Spinach Salad, the butternut squash brings yet another texture component with it’s slightly crisp edges and tender insides. In addition to the butternut squash, you’ll find apples, red onion, and pistachios in this gluten free salad. They are all important players for providing the perfect flavor and texture. You could use pears instead of the apples and pumpkin seeds or chopped pecans instead of the pistachios, but you’ll definitely want the juicy and crunchy components. I hope you give this seasonal Quinoa Spinach Salad a try! If you do, please come back and leave me a comment below with your comment and star rating. I can’t wait to see your remakes, so be sure to tag @veggie_inspired and #veggieinspired on social media so I don’t miss it. A delicious and flavorful fall salad that's easy enough for a weeknight meal, yet fancy enough for the holiday table. In a medium mixing bowl, toss the cubed butternut squash, olive oil, cinnamon, salt and cayenne until well coated. Bake for 25-35 minutes. Meanwhile, rinse and drain the quinoa. Place it in a pot on the stove over medium-high heat with the vegetable broth, salt, parsley, oregano, and thyme. Once boiling, reduce the heat to low, cover with a lid, and continue cooking for about 15 minutes until the quinoa is tender. Because this is a small amount of quinoa, keep a close eye on it to ensure the liquid doesn't evaporate too quickly. Add a couple more tablespoons of broth or water if the mixture dries out and starts sticking to the pan. Do not overcook. Once the quinoa is tender, remove from heat and set aside. Whisk all the ingredients for the dressing together in a small bowl. It will be quite tangy. If you like it more mellow, add another tablespoon or two of oil or water. 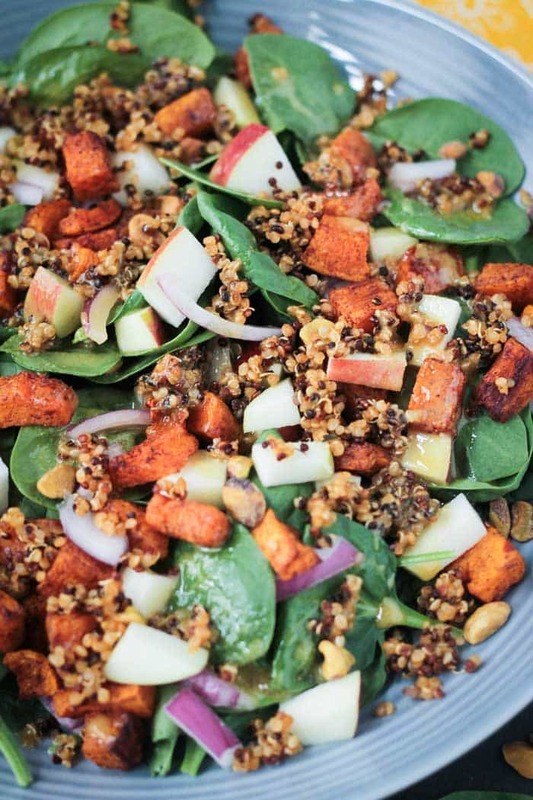 To assemble the salad, mix the spinach, chopped apple, roasted butternut squash, quinoa, and pistachios. Drizzle a couple tablespoons of dressing and taste. Add more dressing if desired. If you're not planning on eating all of the salad right away, do not mix it all together. Mix the quinoa, butternut squash, apple, and pistachios in a bowl, cover and refrigerate. Store the dressing in a mason jar or similar air tight container in the fridge. Store the spinach in a separate container. Hello. Trying to subscribe to your recipes via email, but the circle just keeps spinning! Please add me to your email list. Thank you! Hi, Timarie. Sorry you’re having trouble. I’ll be sure to look into it to make sure it’s not a problem on my end. But, I’ll get you all signed up! Thanks for following along! Woahh this has me droooling! 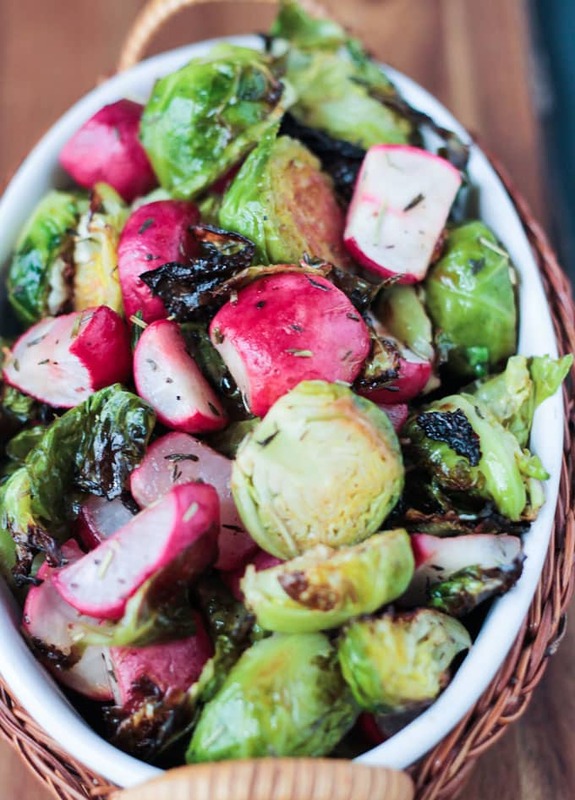 The perfect fall salad! i think i will add this to my thanksgiving recipe list! Thank you, Kerri! I hope you love it! This is fall in a bowl! Looks delicious!!! What a gorgeous salad!!! And I love all of the textures in here – especially the addition of red onion and apple. That dressing sounds absolutely heavenly – I LOVE mustard dressings! Is it bad that I’m already brainstorming thanksgiving recipe ideas?? This salad would be so perfect! My daily salad must now include this recipe in the line-up. Sounds wonderful. Thank you, Ginny! I hope you love it! Perfect! You are one step ahead already. Let me know how it turns out! 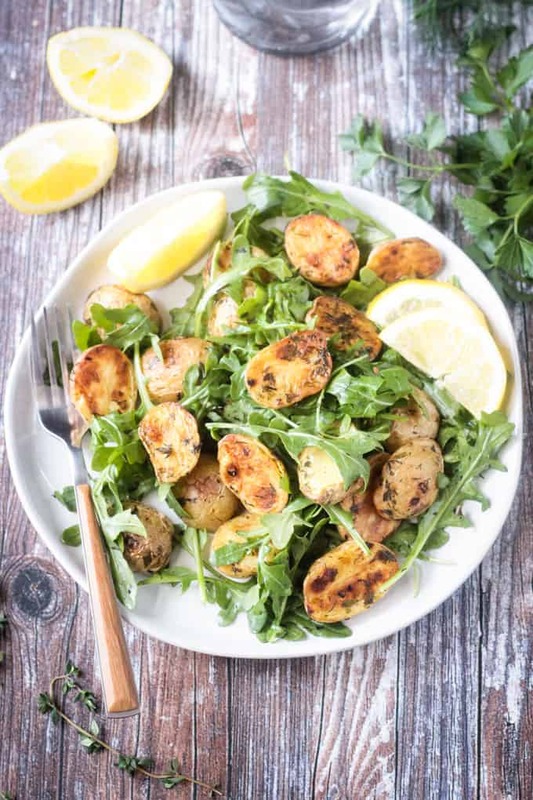 This looks like a perfect way to continue eating salads into the cooler months. I love the addition of apples! Yes! This is definitely one for the fall. Thank you! This looks like the kind of salad that even my kid would want to eat! That is awesome!! Glad to hear he loves his greens! I used to eat tons of b-squash and then last year I just never seemed to buy it :/ I only had it a few times! 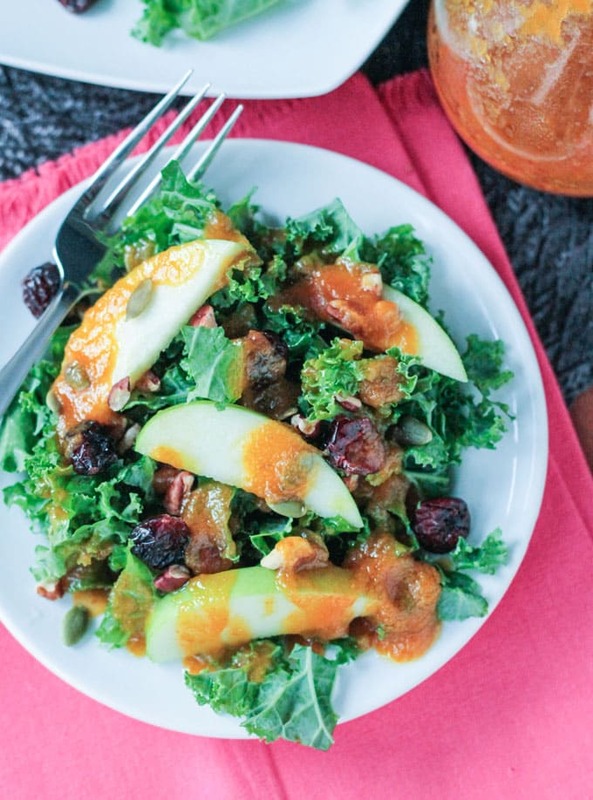 This season…I’ll have to change that…starting with a lovely Fall salad! I buy a butternut squash just about every time I go to the grocery store or farmers market. I LOVE the stuff! Thanks, Rebecca! I’ve been putting apple slices in so many salads lately – the freshness and sweetness is usually the perfect touch! I can’t wait for pumpkin season to begin again, to try all these recipes. Have a great week! I love fruit in salad too. And the apples are just so good this time of year. So fresh and crisp – the perfect addition! Thanks, Vivian!